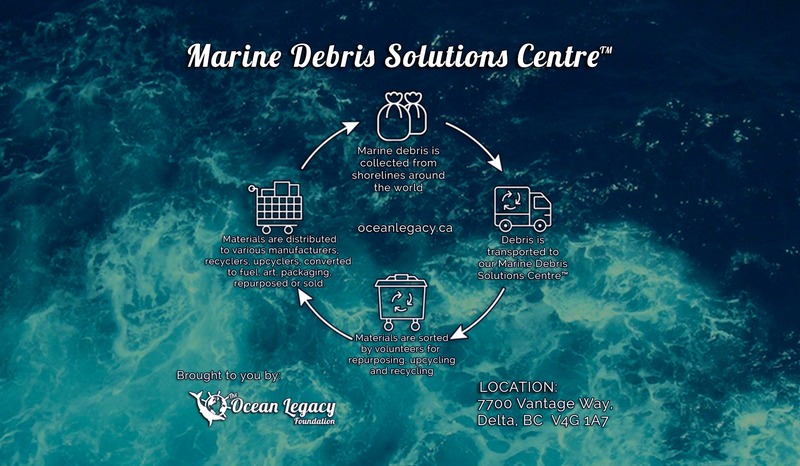 The Ocean Legacy Foundation > Introducing Canada’s First ‘Marine Debris Solutions Centre™’! Located in Delta, this centre acts as a hub to connect recyclers, industries, businesses, concerned citizens, artists, NGOs, non-profits, government and scientists in innovative collaboration to give debris collected from cleanup efforts value. This effort transforms our lense from what most consider 'garbage' into a resource, resulting in new value and incentive to cleanup the natural environment. We do not accept hazardous materials! We will accept any type of plastic found during cleanup efforts and have outlets to recycle cleaner pieces of polystyrene, hard mixed plastics, ropes and tires. Materials need to be lightly pre-sorted according to our Zero Waste Cleanup Program™ in advance before drop-off and need to be coordinated with The Ocean Legacy Foundation. When you arrive with your materials, please make sure everything is is bagged in white industrial supersack bags which we can provided to you in advance. You will need to fill in our sign in sheet which outlines location of where materials came from, approx. volume and your name. Hours of operation are by appointment only. Please make arrangements with Chloé Dubois at by email or by cell at (250) 538-2328.